It seemed prudent to keep a safe distance. More destructive than supplements, at least as unregulated, golf practice aids remain a healthy sub-category of golf commerce. The afflicted, riddled by addiction, despondent for answers and quick fixes, are especially vulnerable. Preying on them like vultures, those pro endorsers should be ashamed of themselves. 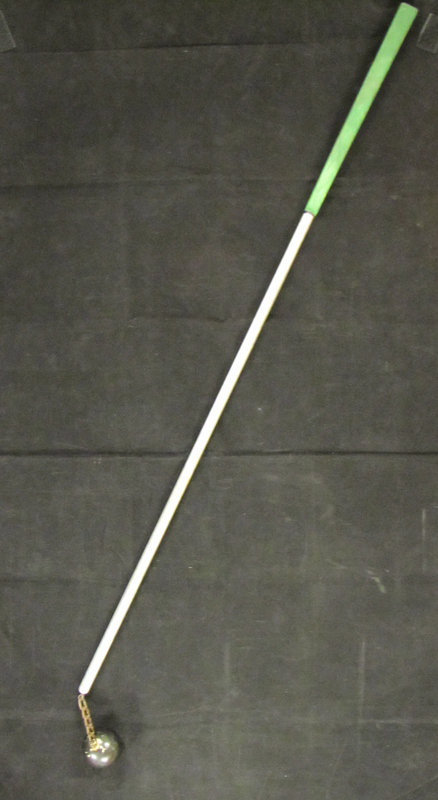 “The weed cutter is still my favorite learning tool,” Harvey Penick wrote with typical frugality, “but if you can’t find one,” he added, “use a broom.” What?! No three easy payments? No infomercial? There must be a catch. What gives? The reference was in Harvey’s final memoir. By the time The Game for a Lifetime came out (1996), there was, sadly, the inevitable backlash to such seismic success – and simplicity. Some people, as Harvey noted, just didn’t care for a straight answer. Dan Jenkins got a wry column out of the discontent with the withered, self-effacing “grown caddie.” He noted pros jealous to cash in with their own pithy homily, “take live aim” and so forth. It wasn’t all that much of a stretch. I heard the sniping. Little known, there was a practice aid of Harvey’s own devise. I don’t believe it had a name. I’m only sorry that the thin tissue label affixed to the top of the shaft that stated “Harvey Penick, patent pending, Llano, Texas” is gone. It came from an elderly neighbor’s garage sale. She’d briefly taken lessons with Harvey at Austin Country Club. I showed it to John Rhodes. A North Texas teacher, John had worked over the years with successful tour players like Tom Kite and Peter Jacobson. He’s the kind of teacher who can’t walk into Lowe’s or Home Depot without finding new construction materials to fashion homemade practice aids. He’s really a wizard, very enthusiastic, and obviously entrenched in the D-I-Y tradition. Inventive, I guess is the word. I haven’t seen nor heard of John in years. I hope he’s well. The last time we crossed paths he was in the Colonial press room. Working for the Star-Telegram, he was tracking something rarely discussed, typical of his active mind. I’ve never tired of noticing his line of inquiry. He was simply tracking what happened to tour players after shooting those terrific low rounds. What he determined, and I’m simplifying for the sake of brevity (sorry, if it’s not really working) was that, often as not, those low rounds routinely presaged rounds eight or 10 shots higher. Or, at least several shots higher. I’ve since discussed this with players but I’ll let that go. John’s point was that someone who shoots, say, 63 and then follows it up with a 74 the next day is, in their way, not all that different from the golfer who shoots 80 one day and is (justifiably) miserable the next day with a 92. Of course, both golfers are justifiably steamed. John was intrigued by Harvey’s training aid. He enthusiastically started hitting a few balls with it, not well. It’s just about impossible. I stood at a safe distance, fearful of getting brained. Here’s Harvey’s reference to the aid from And If You Play Golf, You’re My Friend (1993). Another [training aid] was a chain with a grip on one end and an iron on the other. I could hit a golf ball 150 yards with that contraption, but I quit using it when the cotter pin came loose one day and the iron ball flew off down the range. It could have killed somebody. He also mentions another aid with a special grip but discarded that. You may be able to see that the rubber grip on his novel design is rectangular rather than round. John described what he thought Harvey had in mind but I’ve forgotten, likely timing. Walter Hagen had his name on a little aluminum shaft with a clicker inside. The object was to swing the club so the click would come at the very bottom of the downswing – at the ball – where you want it. Mine always clicked on the way down, symptomatic of various faults. I should’ve bought the Hagen aid, fiendishly simple, but I had the sense to realize it would lead to madness. Of course, Old Tom took the plunge! Golfers will at least recognize the name ‘Old’ Tom Morris, as distinct from his son, ‘Young’ Tom, who was also an illustrious champion golfer when the auld Scottish game was still in the early stages of competitive maturity. Old Tom remains one of golf’s most illustrious figures. An exceptional golfer, he also taught the game, his life devoted to promulgating and spreading it. An expert and innovative club maker, he was an innovative course designer and accomplished keeper of the green. There really has never been anyone else quite like him. Ben Crenshaw, an eminent historian in addition to his successful playing and design careers, has noted a kinship link with the past – true with most things in golf if one is willing to take the time to look. In his legendary mentor Harvey Penick, he sees Old Tom’s generosity of spirit, dedication to golf and to his fellow man. The two shared a similarly long and distinguished life in golf. Beloved and revered are two other words to describe both men. W.W. Tulloch, Old Tom’s biographer, came from a long line of distinguished Scottish religious figures. A friend of Old Tom’s for 40 years, his definitive account remains an important work, and a cherished collectible. Reverend Tulloch’s Tom, The Life and Times of Tom Morris, was published in 1907, a year before his subject’s passing at the age of 87. In an extensive article in the September edition of the British Golf Collectors Society publication Through the Green, entitled “Tom Morris of St Andrews,” John Henderson considers and addresses several recent criticisms of Tulloch’s original work. One of these I’m especially pleased to see him skewer. In it, the authors take issue with an aspect of Old Tom Morris’s personal life, one to which I happily subscribe. 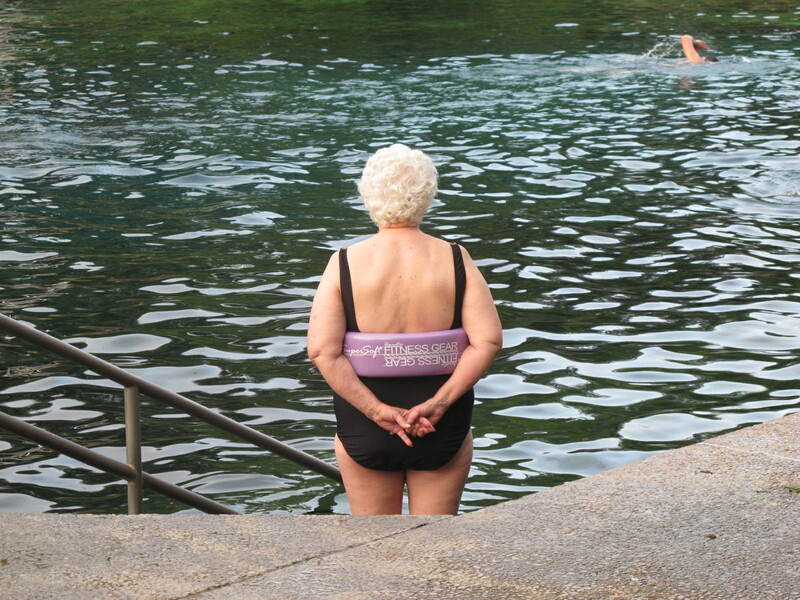 An ancient recreation, cold water immersion is supported by centuries of anecdotal practice. With respect to wellness and longevity, its benefits are periodically confirmed by science, its use widely employed for its beneficial therapeutic value in helping athletes recover from a host of ailments including soreness and inflammation. The thought of swimming in cold water, your correspondent realizes, is widely considered eccentric, even foolhardy, behavior. As it was in Old Tom’s day. I especially like this last descriptive phrase. It rings of truth. As every adept in any sport recognizes, there are inevitably instances when heaven-sent circumstances intrude on regular commitments, here so neatly expressed in the phrase: “notwithstanding the state of the atmosphere.” To me it suggests a certain amount of prudence. The prospect of plunging into cold water, I would suggest, at any time of the year is enough to give a man pause. Rockwood, Henderson reveals, turns out to be a most reputable source. He was an accomplished and respected journalist, a former law student, we’re told, “with a first hand knowledge of horses, hunting, shooting, angling, curling, golf and yachting.” Thomas Dykes, for that was Rockwood’s real name, contributed to numerous established publications. He wrote several books, one of them a pioneering reference on equine breeding. Henderson counters: “This early time would make it very unlikely that there would be any tourists present.” Indeed! 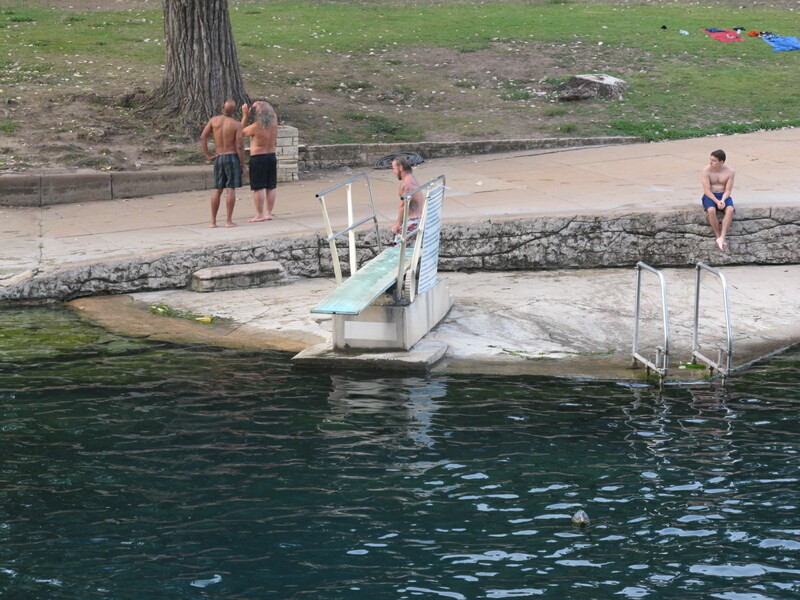 My own experience at Austin’s spiritual center of Barton Springs, believed to maintain a year-round temperature of 69 or so degrees, echoes the point. Early morning or late at night, swimmers are sporadic, let alone tourists, especially in the winter. Many a time have I enjoyed the healing waters alone. Two additional snippets on behalf of cold water immersion, on comes courtesy of another exceptional historical sporting figure, a name likely not unknown to Old Tom. 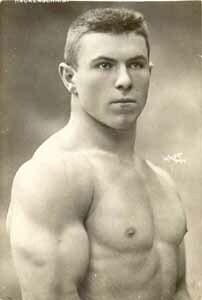 George Hackenschmidt was an international celebrity as a world conquering wrestler, later a compelling voice on advocate for exercise and strength training. He was also a remarkable, and remained a remarkably well-preserved, athlete, up until his death at the age of 90. A famous photo shows him hurdling a chair at 85! His seminal work, The Way to Live in Health and Physical Fitness (1908), is routinely ahead of its time in its insights. I recommend cold baths twice a week, or daily cold washing of the whole body with a sponge, and this upon immediately rising in the morning. This is very healthy and invigorating. One or two weekly baths and daily rubbing of the whole body are necessary. As to the temperature of the water, you must use your own judgment. He who dives into cold water or takes a cold douche when he is hot, or perspiring, suppresses forcibly the action of the pores. As we are all more or less the opposite to “hardy,” such violent attempts at “hardening ourselves” act detrimentally on our health. I don’t know how they (or anyone) quantifies or measures an improved quality of life. Nor would I recognize an IFN-gamma lymphocyte, if we chanced to meet. Your correspondent nevertheless believes the anticipation and experience of the regular bracing dip, and the resultant feeling of ‘aliveness’ has produced faster recovery from soreness, years of avoiding illness, less reliance on air conditioning, and an opportunity to savor, in the midst of an increasingly searing planet, a little bit of Vermont in the shadow of a threatening, intrusive urban environment.